Bari-based executive producer/founder Antonio Martino is attracting a veritable gold mine in Italian and European jazz talents, all converging into a tour de force at new label, A.MA Records. In the two years since its founding, A.MA Records in Bari (Puglia), Italy is becoming known as a powerhouse home for stellar jazz, funk, soul, and ambient electronica talent, all eager to hit the international scene. Established first as a recording studio in 2014 and expanded into a record label within a few short months afterward by executive producer Antonio Martino, A.MA strives to record and release world-class independent "non-rock/pop" styles that endeavor to delight a discerning audience. While the label's name is certainly an acronym based on Martino's own name, at its core, the Italian verb also suggests that the listener should "love" (ama!) what he or she is hearing. 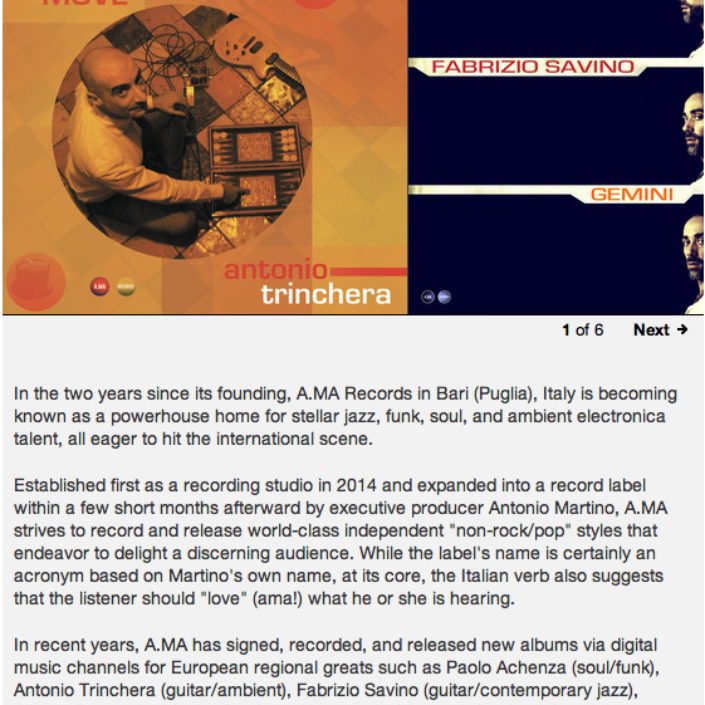 In recent years, A.MA has signed, recorded, and released new albums via digital music channels for European regional greats such as Paolo Achenza (soul/funk), Antonio Trinchera (guitar/ambient), Fabrizio Savino (guitar/contemporary jazz), Alberto Parmegiani (guitar/jazz), and Ipocontrio (piano trio/bop), all the while continuing to function as a premier recording studio for artists on other labels, and simultaneously putting European talents on the musical map. The label began with a house band of Southern Italian master artists, named The Motion Collective, and released compositions from Gerardo Frisina on a Middle-Eastern themed EP ('Burak', available also on vinyl) as well as a full-length Modern Jazz / Ambient album ('Unstuck In Time'), both within only 6 months of each other. The group's first hit, "Into You", featuring soulful vocalist Dhany, swept Internet radio during the summer of 2015, particularly in the United Kingdom, and earned A.MA a U.S. selective distribution partnership with TIMKAT Entertainment. Several of A.MA's artists, Fabrizio Savino, The Motion Collective, and Alberto Parmegiani, were also accepted into Pandora.com's prestigious 'Music Genome Project' for further exposure. Listeners can learn more about A.MA Records' current growth on Facebook at https://www.facebook.com/amarecords and discover the artists via its U.S. music distribution partner, TIMKAT Entertainment (Bandcamp) at http://timkatent.bandcamp.com.